Project For: Aspect Solution Ltd. Rural intersections in New Zealand contribute a significant proportion to the total number of both serious and fatal road accidents. The RIAWS (Rural Intersection Active Warning System) project was conceived as a means to reduce the speed of vehicles on the main road as they enter a rural intersection where there is another vehicle approaching from a side road that presents a potential collision hazard. Each site chosen for the RIAWS trial project was chosen from a list of the ‘100 Worst State Highway Intersections’ in New Zealand. They are all T or cross-road intersections with a normal speed limit of 100kph (~62mph) and a balance of through vs side road traffic that have generated a high number of incidents compared to similar sites. The basic method of operation is as follows: When a vehicle is detected approaching the intersection from a side road, advanced warning signs are activated that either temporarily reduce the main road speed limit at the site to 60 or 70 kph, or alert any driver approaching on the main road with a “Slow Down” warning sign. The signs remain illuminated until the side roads are again free of traffic entering the intersection. To verify the effectiveness of the RIAWS sites, significant amounts of traffic data had to be collected. All sites undergo a pre-activation phase where vehicle speed is recorded for all traffic on the main road but the signs are disabled. After approximately two weeks, the system is then fully enabled, and traffic data recording continues while the signs are operating automatically. In order to complete this project a system had to be developed that would allow the site controllers to be monitored and configured, handle manual operation and alarm logging, collect and distribute the recorded traffic data, and all this would need to be accessible from a central location. We worked together with ASL to develop a hardware platform that would be able to detect the incoming traffic, control the active speed/warning LED signs, and record relevant traffic information for statistical examination. To this end, each site is coordinated by an Allen Bradley CompactLogix PLC which is connected to various inductive loop controllers, traffic radar, LED signs and vehicle speed recorders. The first 2 “Generation 1” sites used a rack-mount type PC located in the local main cabinet that would periodically record the traffic logs from the PLC and store them in an Excel workbook and then dump them to a backup folder. 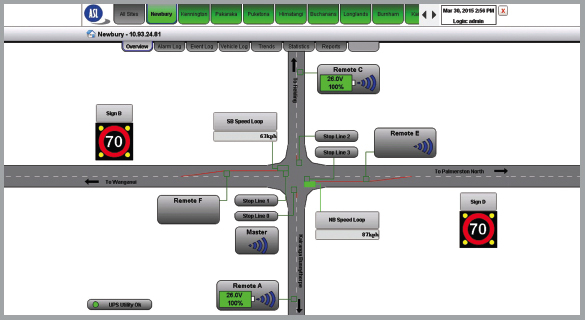 The monitoring and manual control of the site was accomplished using typical HMI software that also ran on the local PC and connected to the site PLC. As more sites were scheduled to be added to the system, it became apparent that this solution was neither scalable nor efficient. The rack-mount PCs had their data manually collected, only one site could be monitored or controlled at a time, and each site would need a new PC and new set of software licences each time. Ignition provided us with the tools to build a vastly improved system with an intelligent structure that is more reliable, easier to maintain and expand, and provides better features to users of the system at all levels. The NZTA (New Zealand Transport Agency), the government organisation that initiated the project, assigned a server at one of their datacentres as the Ignition Gateway machine. This machine was also configured as a MySQL server to store the traffic data and some configuration settings. In addition to the original 2 sites that have been migrated over to the Ignition project, an additional 8 sites have been added to the system from various locations around the country. The sites are monitored and controlled from the central Ignition system. Tables and trends make the traffic data readily accessible, and Ignition also maintains an automated e-mail list to provide the traffic data directly to the project supervisors and statisticians responsible for assessing the effectiveness of the RIAWS system. Using Ignition to build and develop the core of the RIAWS system allowed us to create a platform that is easy to extend, and makes the large amount of data collected available to those who need it. The data collected has shown that the RIAWS system itself is effective in changing driver behaviour, reducing the KSI (Killed or Seriously Injured) risk by approximately 50% when the possibility of intersecting traffic is present. Even after 12 months of becoming accustomed to the system, drivers still respond to the active warning system at close to the initial rates. RIAWS gives the operator a visual representation of the vehicles and their speeds. 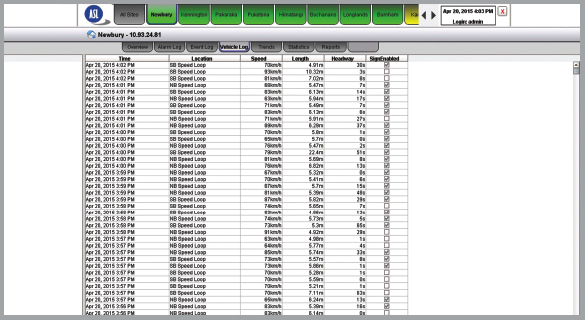 Vehicle speed and location is logged to analyze the effectiveness of the system. RIAWS is located in many of the location that have been reported unsafe for drivers.